For Madina Lake, World War III closes one chapter and opens another. The Chicago quartet of twin brothers Nathan [Vocals] and Matthew Leone [Bass, Vocals], Mateo Camargo [Guitar, Programming], and Dan Torelli [Drums] has endured more in the past two years than most artists will experience over the course of an entire career. Since they released their sophomore full-length, 2009's Attics To Eden, there were moments of tragedy. There were moments of terror. There were moments of trepidation. There were moments of triumph. All of those moments have been captured in the band's entrancing and enthralling third epic, World War III, due out September 13, 2011 via Razor & Tie. 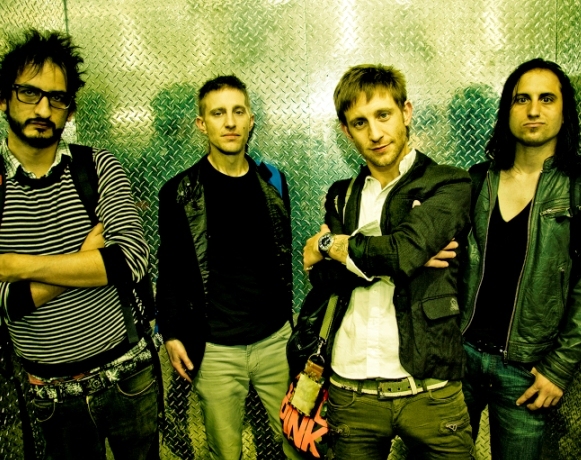 Madina Lake set the stage for an immersive three-album trilogy with their debut, From Them, Through Us, to You in 2007. Set in the fictional 1950's town of Madina Lake, the story began with the disappearance of a gorgeous local celebrity named Adalia. The denizens of the town frantically searched for her as the band introduced more characters in Attics To Eden. The plan for World War III was to outline the battle between good and evil in the final chapter of this fantasy, however, real evil intervened. In June 2010, Matthew was brutally injured after stopping a man from beating his wife. He ended up in a coma for five days with a fractured skull, broken jaw, and a swollen brain. Doctors had to remove a third of his skull in order for the swelling in his brain to go down. Musicians and the world came to Matthew's aid, with The Smashing Pumpkins even playing a Chicago benefit that raised $80,000 to cover his medical expenses. After four months of recovery, Matthew was back in the band's studio, The Attic, working on new material with his brother and bandmates. This heinous trauma eventually filtered into Madina Lake's most powerful and poignant music yet. "We basically survived a bombshell throughout making the record," recalls Matthew. "The unexpected reality of what we went through was instilled into this phase of the story. In the mythological realm of Madina Lake, there's a palpable sense that something catastrophic is on the horizon. When my accident happened in real life, it was a good example of what we were trying to depict in the story. We were writing about the fear of the unknown. Then, it became the known." Instead of crumbling under the weight of this experience, Madina Lake grew stronger in its wake. Nathan goes on, "In a totally bizarre way, our lives really wrote the ending of the story that we had in mind the whole time. We were literally living out an extreme example of the trilogy's entire point." As a result, Madina Lake sound more alive than ever before. Recorded and written with Camargo self-producing, World War III sees the group following every creative impulse to the fullest. On the album's first single "Hey Superstar," elegantly ethereal textures bleed into propulsive guitars just before an anthemic hook takes hold. The song rises and falls like a roller coaster of riffs and melodies. "The song is an attempt to define what the ego is and what it's done in this current day and age," explains Nathan. "People are constantly trying to alter who they are. On social media sites, they'll enhance their image with Photoshop or get cosmetic surgery. They're constantly posturing, wanting to be bigger, cooler, more successful, and more attractive than everybody else. It's this big competition to be all of these things that ultimately don't matter whatsoever. It's about the dangers of the ego." Other songs bring listeners closer to the band than ever before. "We Got This" is an uplifting tribute to Matthew from Nathan, showing the strength of their bond. Meanwhile, "Howdy Neighbor!" viscerally calls out Matthew's attacker with a vicious verse and a battering chorus. Matthew adds, "It's Nathan's open letter to my assailant. That's the most deliberate, unabashed approach to the sentiment we feel. It's unbridled, unadulterated, and there's no political correctness. This is what we want to say. That song was a perfect storm. The music and lyrics matched perfectly with each other. It was created just from channeling and appeared in a state perfect to us." "Imagineer" proved to be a truly "perfect" dream come true for the twins. Matthew and Nathan planned on taking a week-long retreat to Sedona to hang with legendary Smashing Pumpkins mainman Billy Corgan. Focusing on Matthew's healing, they didn't think they'd end up working on music with Corgan, but "Imagineer" was born from one of Corgan's riffs during that trip. "Billy met and even surpassed our expectations of what kind of man and artist he is," says Matthew. "While he was working on Pumpkins music in Sedona, we made a really deep connection with him, philosophizing about music and life. He took us hiking up through one of the vortexes. It's like a power zone. We sat on a rock up there for two hours and had a two-hour conversation that was the most rewarding and fulfilling engagement we've ever had. On day six, he was like, 'Alright, let's work on a Madina song.' That's where 'Imagineer' came from, and it's one of the most powerful moments on the record." The song bridges the gap between classic psychedelica and modern alternative bliss, seeing two generations harmoniously converge. The album reaches its apex on closer, "The Great Divide." It's a haunting and hypnotic ending to both the fictional story and this experience. Nathan continues, "When Matthew was in the coma, it was the first time in my life that I was psychologically alone. I always considered Matthew and I one person. It cut me in half. There's no protocol on how to deal with being split up from your twin brother. Lyrically, I was at a loss for words, but this song arose from that feeling." 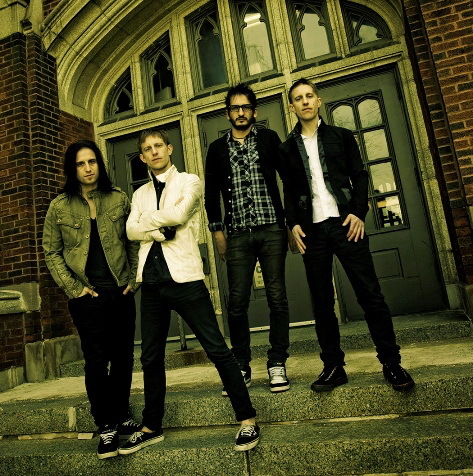 Near the album's completion in April 2011, Madina Lake signed a deal with Razor & Tie to release World War III. With the label's partnership, they're ready to share this story with the world. Nathan excitedly exclaims, "We're partners, and we all want the same thing. We're a team, we all want the same thing, and we're busting our asses to do it together. We're lucky to share that philosophy." They also can't wait to get back on the road. The band has shared stages with everyone from Linkin Park and My Chemical Romance to Paramore and Taking Back Sunday. They've been recharged with a new live vigor. Given the events of the past two years, Madina Lake are ready for anything. Matthew concludes, "You have to have hope. You have to live in the moment. You can't regret the past. You can't be anxious about the future. The weight of everything is magnified, and every second of being able to do this feels like a blessing. This is more powerful and enjoyable than ever." For Nathan, there's one crucial thing he wants listeners to walk away with. "You can survive anything," he declares. "What goes down shall rise again. Life will throw things at you that you can't even fathom surviving, but you can. If someone feels that after listening to World War III, we've done our job. To have the opportunity to make music, we're the luckiest people in the world. Thanks to everyone for saving the life of my brother and the band."